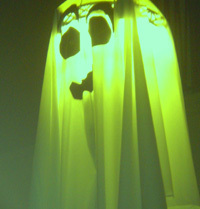 Ghost stories are fun to hear and fun to tell, especially at this time of year, but are they truth or are they fiction? Scoff if you like, but according to some studies, approximately one in five people believe they have seen a ghost, and a Harris Poll conducted five years ago found that more Americans believe in ghosts than don’t. Me, I’ve been on both sides of this issue. I once worked for a research foundation in New York which funded studies on UFOs and paranormal activity with a hard-line skeptical attitude: “Prove it.” Many grant recipients did, at least by presenting evidence of anomalous experiences that could not be explained in standard scientific terms. Others didn’t. In my own life, I’ve seen ghostly apparitions debunked, but I’ve also felt some things – extraordinary things – that are hard to explain. Let’s just say I don’t mention those things on most job interviews. Whether you go in as a true believer, a skeptic or a fun-loving thrill seeker, a good ghost hunt will almost always lead you to some old, creepy place that is dark and dilapidated. Often you will find yourself surrounded by real physical dangers, like rotten floorboards, big spiders, rusty nails and angry vagrants. For this reason, the first rule of ghost hunting is to never go it alone. The second rule is to bring a camera or voice recorder just in case an “orb” or other evidence of a discarnate entity presents itself. So, where to start in Nevada? According to The History Channel and paranormal investigator Janice Oberding, Las Vegas is a “hot zone” of cold spots, unsettled spirits and well documented anomalous experiences. One of the spookiest places is right on the Strip, at the old MGM Grand Hotel. Renamed “Bally’s” shortly after a gas explosion in 1980 killed 87 people and seriously injured hundreds more, the building is the site of one of the worst hotel fires in history. Walking across the casino floor late at night, or staying in the tower where so many people died of smoke inhalation, still spooks many employees and guests on a regular basis. Although the hotel has been remodeled at least three times since the fire, voices, cries for help and even the occasional apparition are still reported almost 30 years later. The fireball from the explosion of underground gas tanks is estimated to have ripped across the ground floor of the casino in only nine seconds. It was so hot that it charred some unlucky gamblers instantly, leaving a few with their hands still clutching the slot machine levers or holding their drinks. It’s easy to understand that some spirit might have a parting wish or message to share when the crowds thin down. Another spooky spot is Sunset Park on Eastern Avenue, where more than 200 bodies were left in the ground when an old cemetery was converted into a public recreation area in the 1950s. Another is the area around the Stratosphere Hotel and Casino, at the north end of the Strip. I’ve always had an uneasy feeling there, perhaps because several people have jumped to their deaths from the observation deck and upper rooms of the hotel (the windows are not sealed shut). Like the gamblers at the old MGM Grand, these spirits may have nowhere else to go, so they linger. Sometimes, what happens in Vegas, stays and stays and stays in Vegas, which is what makes Sin City such an attractive town for avid ghost hunters. Not all ghost stories in Vegas are quite so grisly, though; some, not surprisingly, feature a celebrity appearance. Liberace is said to haunt Tivoli Gardens as well as his namesake museum with a kind and whimsical spirit. The audacious performer is also known to visit Carlucci’s, his favorite restaurant, and, along with Elvis, the Las Vegas Hilton, where stagehands report hearing distant laughter, singing and the occasional relocation of tools (some sort of ectoplasmic practical joke, apparently). Wayne Newton, in his autobiography, also mentions seeing Elvis’ friendly ghost at the Hilton. And although Bugsy Siegel met his bloody end in Beverly Hills, his ghost is said to happily roam the gardens and the Presidential Suite at the Flamingo, in company with his beautiful red-headed girlfriend Virginia Hill, whose pink, sunburned legs inspired the name of the hotel. A fun way to get acquainted with the most famous Vegas haunts is to take the Haunted Vegas Tour; tickets cost about $65 per person for the 2.5-hour bus tour around town, but keep your eyes open for periodic two-for-one coupons in coupon books around town. Janice Oberding’s Web site HauntedNevada.com is a good starting point for research on haunted places, as is the Ghost Research Society, which offers many practical tips, guides and advice on ghost hunting. If you are interested in hunting a few ghosts yourself, take a look at the Unofficial Ghost Hunter’s Code first. You may not agree with all 25 statements that make up the code, but they make for interesting reading and might prove useful when you’re out in the field on a spooky night with nothing but a flashlight, a camera and a funny feeling that you’re not alone. Of particular note for anyone interested in the paranormal and the occult is Sin City Para Con, a conference on the paranormal to be held right here in the least normal city in the U.S., from Oct. 23 through Oct. 26 at the Plaza Hotel. It might look like it’s going to be a freak show from the lineup of speakers and performers, but amid all the self-promotion you’re sure to find someone – or something – that will raise the hairs on the back of your neck! I didn’t know that about Sunset park. Very interesting. I take my kids there a few times a year….now I know I’ll get creeped out walking around the playgrounds! It’s like the movie Poltergeist… except for real. 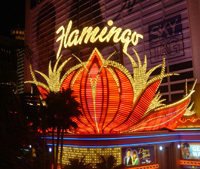 By coincidence, author Janice Oberding is going to be at the Clark County Library on Flamingo tomorrow night (Thursday) at 7 PM and signing copies of her new book “The Haunting of Las Vegas” – I didn’t know it was coming out when I wrote the article, but I bet it’ll be interesting. Guess I’ll be missing another episode of “Survivor” again! Interesting and timely article, with Halloween coming and I’ll be in Vegas over the spooky holiday. Help us get to All Saints’ Day! Wow, that’s pretty odd Shannon. I didn’t come across anything about any disgruntled waiters at the Stratosphere but apparently there’s a story there too! Thanks! Maybe we should get a blog of Vegas ghost stories going? Hey great article Eric. I do follow your articles and hope to see you at the Para Con. Thanks for raising awareness about the convention. If anybody is looking for a good true crime book that lists many of the “Haunted Rooms” on the Las Vegas Strip. I suggest reading Vegas Strip Deaths. It is pretty detailed. You have to be a freak like me to appreciate it. Hey Eric I was wondering where you found the info about Sunset Park I cant find anything about it? Came across your site & hope you can help. We’re doing a Haunted Las Vegas cover story– but as it pertains to the suburbs. My coverage area is Summerlin, The Lakes, and a portion of the northwest (west of Rainbow up to Lone Mountain Road). I am getting desperate. Do you know of any haunted places there — a park, a strip of road, a tavern, how about Red Rock Canyon? Or can you point me in the direction of someone who might? Homes count, too. (If a resident has a ghost in their home, we will NOT publish the address. We can also just use his or her first name, if they prefer.) Apprec, your help! P.S. Am not a skeptic. I grew up in a house with a ghost & my daughter and I see them from time to time, mostly when we travel. In Green Valley Ranch, Discovery Park on Paseo Drive is supposedly quite haunted. There are lots of memorial plaques scattered about, mostly kids and teenagers who died rather young. I know someone who took some interesting pictures of late night orbs and apparitions there. Apparently it’s a pretty well known haunt because I know that Discovery Park is included in some haunted Las Vegas tours. Yes, there are a couple of places around Red Rock, too. One is called the Valley of the Orbs. Spring Mountain and Bonnie Springs are also quite well known for their ghost stories. Are you doing this for the R-J or something else? Let me know if I can help. That bit about Sunset park isn’t true. It started out as Miller Ranch, then it was the Vegas Stock Farm where they trained race horses. Parks and rec acquired it and turned it into Sunset park in the late 60’s. It was never a cemetery. Sorry to ruin your fun. I always wondered what a cemetery was doing in that location and where the 2000 bodies had come from. It was quite a ways from town in the 1950’s, so thanks for this interesting bit of information! Ben/Mark – I heard the story about Sunset Park from a retired mortuary worker. You might not be able to find another reference on the Internet about it, but that doesn’t mean it isn’t true. Things have happened in human history that are not on Wikipedia. In the ghost-hunting community, Sunset Park is a special place for a reason. The story I heard from the mortuary worker was that the city did not want to maintain the cemetery that came along with the purchase of the John F. Miller Ranch in 1967. The fact that the Paradise Memorial Gardens opened down the road at 6200 S. Eastern just two years later might be a coincidence, or the result of a savvy businessman who seized the opportunity to get a special zoning ordinance quickly approved and launch his business with a discreet work-for-hire contract with the city. You can chose to believe what you want, but in light of the fact that the entire area around Sunset Park was working ranch country from the early to mid 1900’s, it’s not unlikely that a graveyard came to exist for the very close-knit families that didn’t have the money, or the inclination, to bury their dead “all the way” downtown at the Palms Mortuary. There’s also the question of where several generations of migrant workers came to rest out there in those sun-blasted fields during those early years of Las Vegas history. And Mark, the area wasn’t completely isolated from the population base. The Alamo Airport (now McCarren) opened in the 1930’s. Pauper’s graves and old cemeteries being plowed under or re-developed is not uncommon for towns that eventually grow into cities. It’s hard to believe, for example, that Washington Park in Manhattan was an isolated pauper’s graveyard for years before New York expanded beyond Canal Street. New York City left the bodies in the ground. But, you can both believe what you want to about the whispering history of Sunset Park. If you haven’t been there and heard one of the distant voices for yourself though, it doesn’t mean they aren’t there. With respect to the Sunset burial area — I have no doubt that the ranch could have had a private cemetery. Everyone of my family’s ranches has one or more. There’s a good bet that there are some buried horses and other animals there as well. But 2000 bodies is a lot even if the cemetery was used for many, many years. For the period in question, even 50 bodies would have been a lot. But perhaps there are still some lost spirits wandering around there. It makes a good story and a popular article no matter what, especially this time of year! I can recall some unexplained things happening to me as a kid, but now I question if they were supernatural or created by youthful ignorance. i stayed on the 24th floor of “Bally’s hotel about 18 months ago.headr movement,felt presence in room,woke to flash of f fire.have photos withs faces in them,possible orbs. In response to Jan Hogan’s post regarding haunted locations in the Summerlin area. She might want to look into a place called “The Bee Farm”. It was located in the neighborhood across from Leavitt Middle School, off of Lone Mountain and Buffalo. It’s rumored to be the location of a violent murder suicide and many people say they have seen their ghosts and even the image of the family’s dog hanging from a tree all covered in blood. I’ve been told that the property has been demolished and I’m not sure if anything has been built in it’s place. Nor am I sure of the validity of the hauntings, or the facts. I just know that it is a common haunting story shared over the last 5 years or so.